Jacob Espania (from left), Casey Gamiao, Shanyce McAvoy, Kainoa Tabaco, Lindsey Saludares, Kiele Pahia, Abby Clayton and Kainoa Davis after the crowning ceremony of the Miss Fabulous Teen 2016 pageant at Maui High School on Sunday, October 23. Photo by COLLEEN UECHI, courtesy of The Maui News. 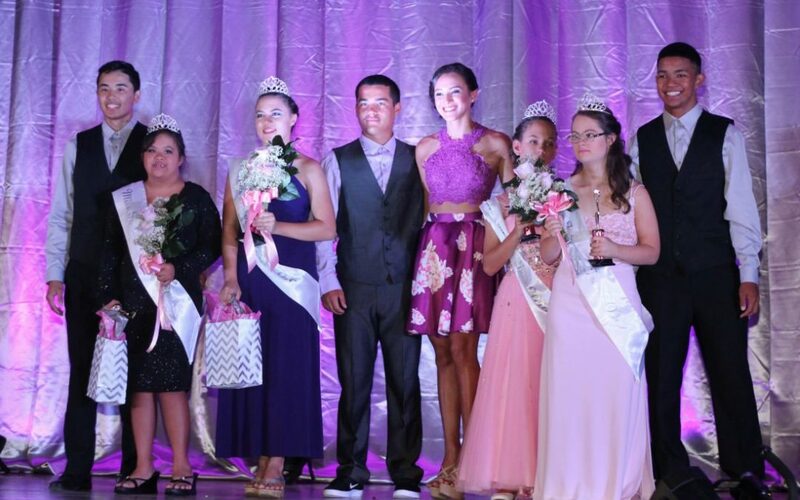 For those of you who didn’t catch this article in the Maui News, take a moment to warm your hearts with the story of Lindsay Saludares and the five Miss Fabulous Teens who were celebrated at a teen beauty pageant on Sunday, October 23 at Maui High School. This beauty pageant was unique in that its contestants — Abby Clayton, Kalikokielemae’ole “Kiele” Pahia, Nadia Engert, Shanyce McAvoy, and Casey Gamio — as well as pageant organizer Saludares all participate in Best Buddies Hawaii, a nonprofit organization dedicated to enhancing the lives of people with intellectual and developmental disabilities. Saludares, a 17-year old Maui High student, threw this beauty pageant as part of her senior project, but more importantly as a community service that connected two of her personal interests: beauty pageants (she is the reigning Miss Valley Isle Teen USA) and her volunteerism with Best Buddies. Needless to say, the five contestants, all who have some form of intellectual or developmental disability, happily shared their many talents with the crowd; and likewise everyone involved had a truly fantastic time celebrating these special young ladies. Didn’t read the article yet? You really should — click here. We were honored to light this event and witness the joy shared between everyone in the room. We were impressed by Saludares who took it upon herself to organize this event. And of course, we are grateful for Best Buddies Hawaii that creates the opportunities for people with special needs to seamlessly engage with their fellow community members. In short, we were floored by the entire thing from start to finish! We were so moved that we decided to make our own contribution to Best Buddies Hawaii in support of the wonderful work they do. Because for us, this is what life and work is about. We don’t light events simply for the fun of it (though we genuinely do enjoy the art of lighting!). We have built this business as a means of connecting with our community by doing something we love and that we know can positively affect our fellow humans. It’s pretty amazing when you can have fun, do meaningful work, and have a positive impact on your community, all in one package. That’s our goal. How are you connecting with your community? We think that’s a healthy question to ask ourselves continually, and we hope you do, too.